It’s beginning to get hot in the sewing room, which means I need to turn on the air conditioning. I’m pretty stingy with the air, since we live in a fairly moderate climate, but I can’t let that keep me from my sewing, so the air must go on. I made the longer version this time – the one with the cute collar. 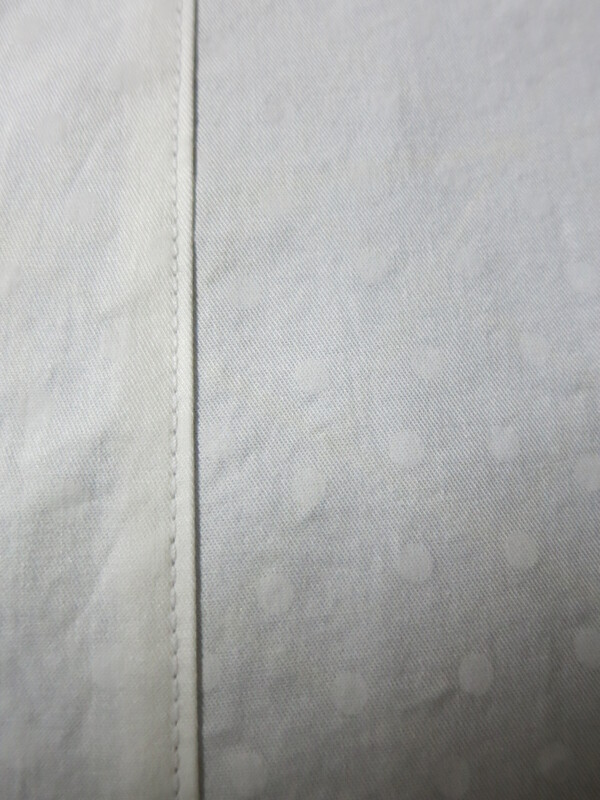 This collar is made by fusing the interfacing in three sections with space between so that you can fold and iron the collar as shown on the envelope cover. I did it that way, but then I decided I like the collar unfolded A LOT, so I left it that way. In the future, if I want to change the collar, I can easily do that. 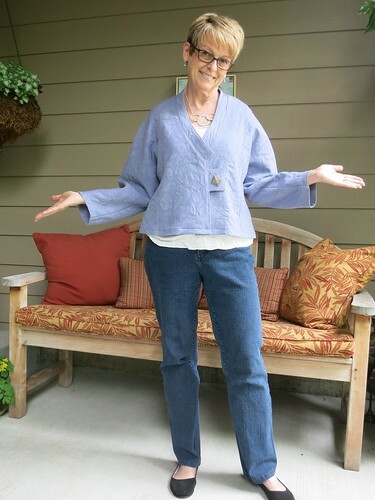 I used the extra small sizing, and there is still plenty of ease in the final jacket. I made no other alterations except to shorten the length. I cut a bunch of inches off the length (can’t remember right now, but I’m going to say something like seven). Because I cut off so much, I made sure I did that at the lengthen/shorten line. I was still worried about losing the proportions, but I don’t think I did. I generally don’t look good in a long jacket style, and my intention was to make this a “big shirt” type of jacket. I think it turned out to have a “swing jacket” vibe. I used a stretch cotton bottom weight that I got from Marcy Tilton. It will be a nice layering piece for summer evenings, spring, and fall. I didn’t put in the pockets, since I’m not much of a pocket girl. This is a self-serving and gratuitous post to get my picture on the wonderful Not Dead Yet Style blog. Thanks so much to Patti for making we women of a certain age visible again! I hesitate to even mention this disaster, because I know what you all will say, “What the heck was she thinking?” If you don’t know me in real life, let’s just say I like to live life dangerously. If someone says to me, “you really shouldn’t try that at home”, I probably will. I’m a bit of a risk-taker. Enter the Frixion Pen. I love these pens! I use them to mark fabric, not ALL fabric, but most fabric. And they work beautifully! 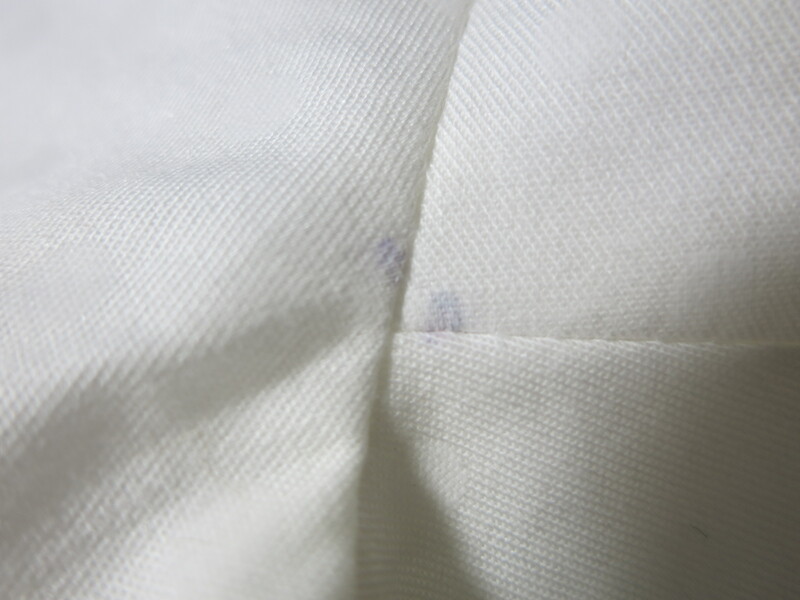 I can use a really dark colored pen to mark the lightest fabric! 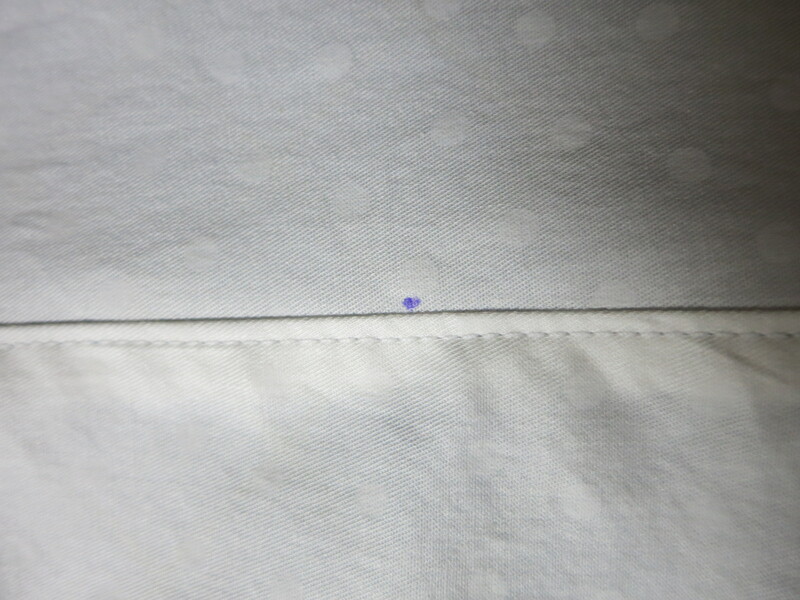 Finally, I don’t have to strain my eyes to find the correct markings on my fabric pieces as I’m sewing. This is truly marking heaven…or is it? 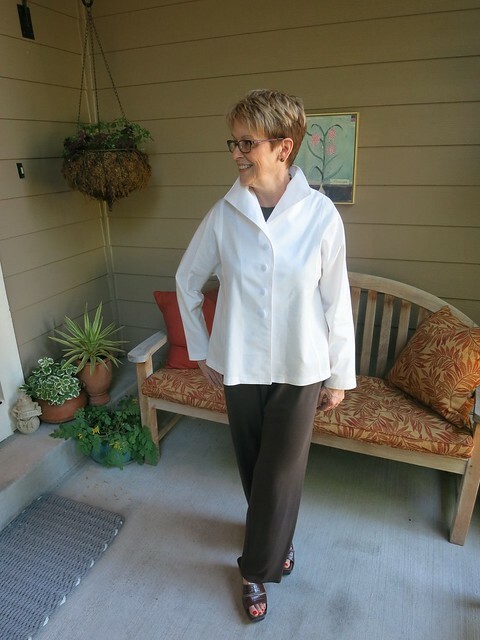 I’m making a white, yes white, jacket/blouse combo. The fabric is a lovely cotton-lycra jacquard from Marcy Tilton. So what color Frixion pen did I decide to use? Purple, of course. You know where this is going. 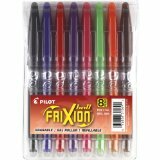 Will I continue to use the Frixion pens? Yes indeed. I’ll just be more careful about double marking. What are your marking tool disasters? Misery loves company! It has been awhile since I have sewn a Cutting Line Design pattern. Awhile back, these patterns had so much ease, I couldn’t even sew the smallest size without doing some major alterations. That, or just look overpowered in my garment. But now, they seem to be slimming down a bit, or did Louis just add an extra small size to the patterns? I don’t know. I love the instructions on these patterns. They are very detailed and leave nothing to guess about. Terrific illustrations go along with the well-written instructions. 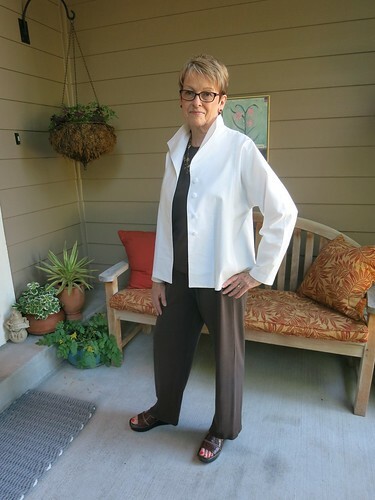 And Louise Cutting, the designer, always includes sewing tips that enhance the quality of the final product. It’s worth it to note that the only alteration I made to this pattern was to shorten the sleeve. I usually do a narrow shoulder adjustment, if nothing else. But, this jacket has something Louise calls “military princess seams”, the seams running from front to back. 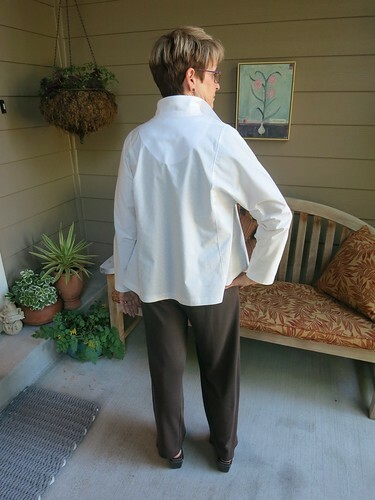 This gives the illusion of a shoulder line, so I think it works for my narrow shoulders. This was a very fun project and I highly recommend this pattern. I am definitely going to sew the longer version…oh, and make some pants to go with this version :). 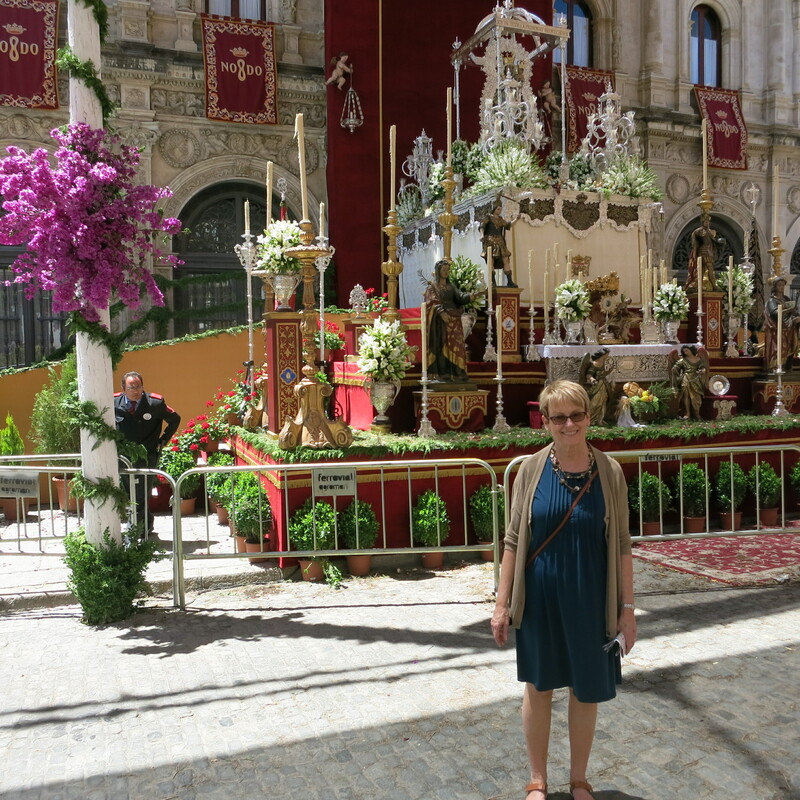 We just got back from Spain, and I wanted to share with you my travel wardrobe. I was very pleased with what I took this time. Everything fit in one carry-on size bag (which I can’t carry on because of the dang liquid restrictions). I don’t know how TSA thinks a woman of a certain age can possibly go on a two week trip with the bottles of liquid one can fit in a quart-size baggie! I have learned over years of traveling that knits are the easiest to wear, pack, and launder while on the road. They are comfortable, they fold to nothing, and I can wash them in a hotel sink with Eucalan, a great product that you don’t have to rinse out. Knits dry pretty fast (it depends on the knit, of course). Okay, now for pattern numbers, clockwise from top left: The white top is a frankenmorph of Katherine Tilton’s Vogue 8710 and Vogue 1261. Vogue 8710 goes to just below the bustline. The blue top to the right of it is the same frankenmorph. The only difference is that the pleats on the sleeves are folded inwards instead of outwards like the white top sleeves. The blue top on the dummy is Vogue 1261 without sleeves. 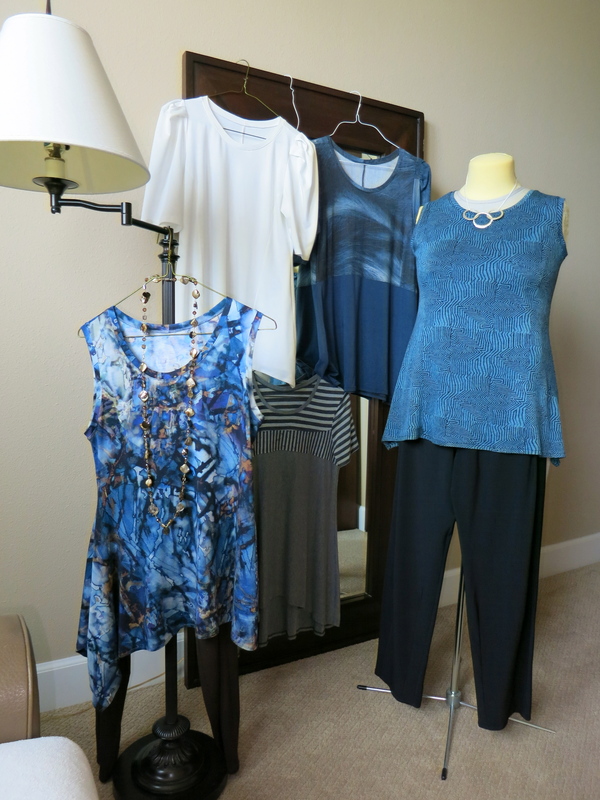 The gray top is Katherine Tilton’s Vogue 8817. 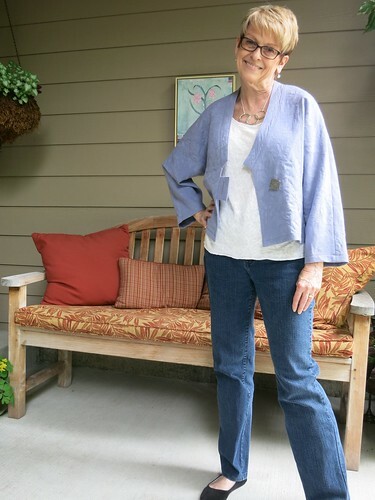 The blue top on the hanger is Marcy Tilton’s Vogue 8582 (OMG, it’s out of print – when did that happen). 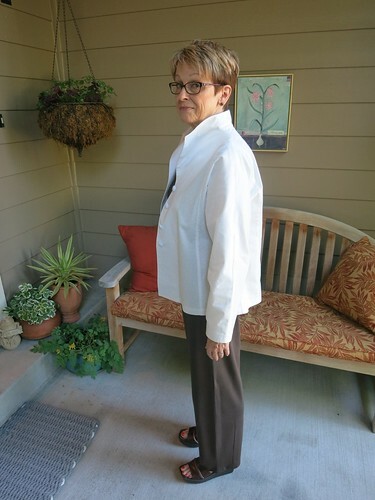 Both of the pants are a modified version of The Sewing Workshop Hudson pants. I have slimmed them down a bit. So, that’s 5 tops and two pairs of pants. You can’t tell from the picture, but the pants are black and brown. They are made from that indestructible Parisian microfiber knit that Marcy Tilton sells. I can’t rave enough about this fabric for travel. I wore these two pairs of pants almost daily on my trip, washed them in Eucalan, hung them to dry (which they easily do overnight), and put them back on again (no ironing). They are lightweight and cool for a hot climate, as well. This fabric won’t work for cooler climates. 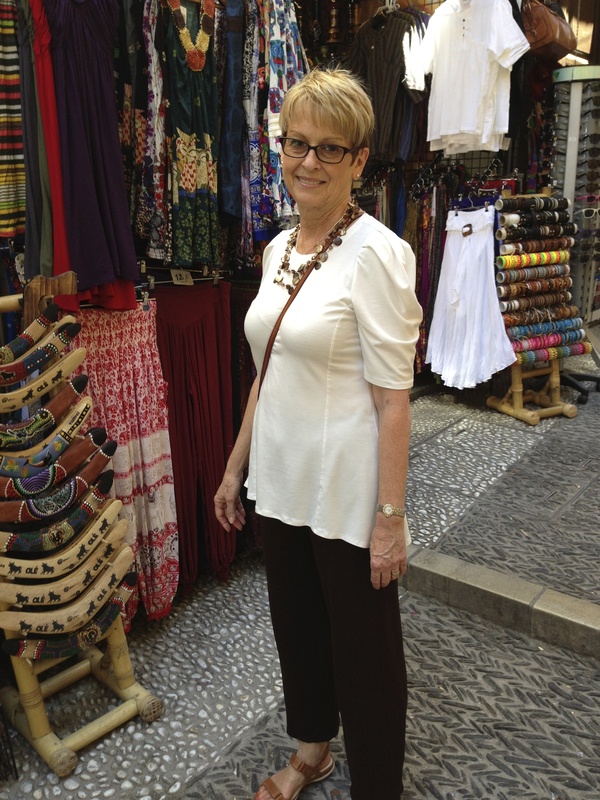 Those two pairs of pants, and about 10 knit tops were my key wardrobe pieces for two weeks of travel. Yes, I did take a rain jacket, some shorts for a bike trip, and two lightweight sweaters (one black and one camel) as layering pieces. Also, I made two dresses out of the microfiber knit and took them as well. One thing I noticed from these pictures: As much as I love the crossbody bag for travel, it really isn’t the best look, is it? I’ll probably continue to use a crossbody, but I might try one with a thicker strap and see how that looks. 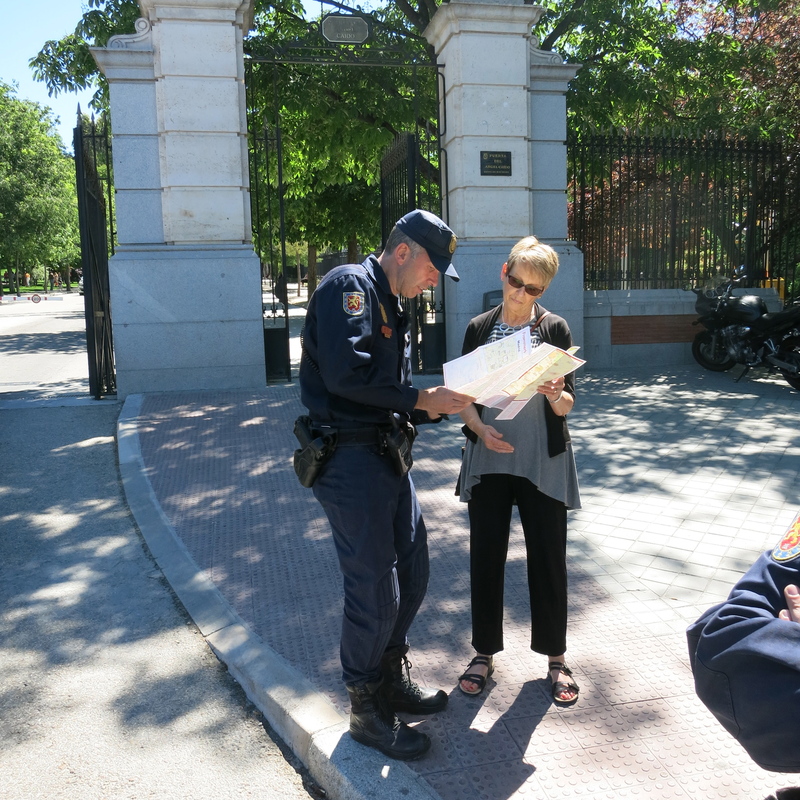 We had a wonderful time in Spain. The people are very friendly, the food is good, and weather was fabulous. The culture is interesting, so what’s not to like? It’s been awhile since I’ve updated you on my progress. I’ll start at the beginning. Notice the little dart in the lining. That dart is in the lining only, the public side is actually eased and shaped with heat and steam. I am learning so much about how couture garments are made, and loving every minute of it! This type of dart shaping is continued as long, horizontal darts on the front and back pieces to shape the waist. I’m currently working on quilting the back and shaping the darts there. More later on the Chanel jacket. 1. 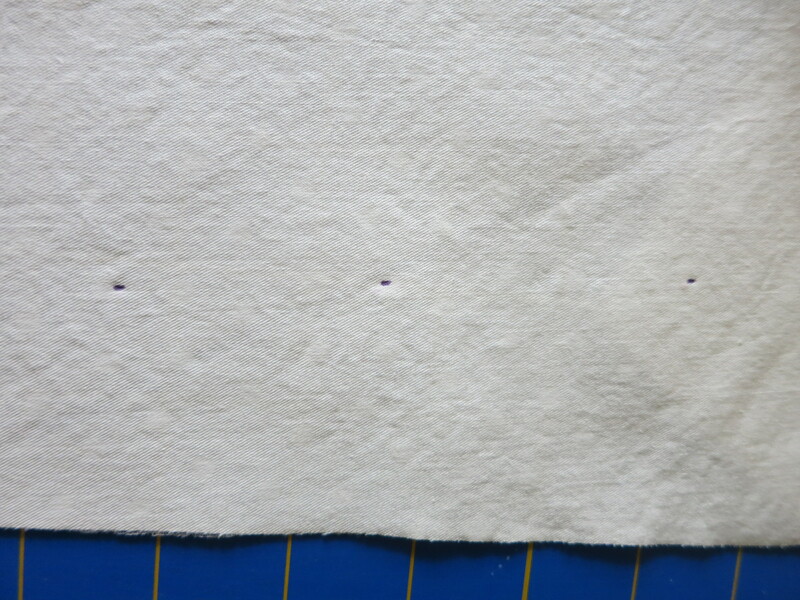 Cut lengths of knit fabric, about 1″ wide. The length will depend on how long you want the scarf. I would start by wrapping a measuring tape around my neck and measure from there. I think on the one I made, I just cut it 1 yard long because that’s how long my fabric pieces were. But, I do wish it were longer. 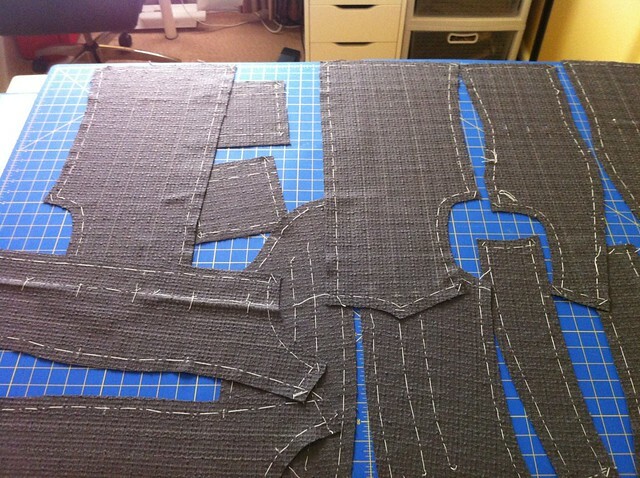 When you cut the fabric, it will role automatically, either a little bit or a lot, depending on the fabric. 2. You don’t finish the edges. Leave them raw. 3. Let the lengthwise fabric role as it will. Pinch the rolled ends together and sew, overlapping the seams slightly. You now have a long, sort of rolled circle. 4. Make as many of these circles as you want, depending on how thick you want the scarf. 5. Put all of the overlapped seams together, and wrap a piece of rectangular fabric (the band) over them to hide the seams. Hand stitch, making sure you take up some of the circles to hold the little band in place. It’s an epic project because of the preparation and sewing techniques involved. My goal is to greatly improve my sewing skills during the construction of this jacket. Hope springs eternal. I bought the fabric during a wild shopping moment in London. Don’t ever go to Joel & Son unless you want to unload some cash! It IS a wonderful fabric store, but I’m glad it isn’t located in my town! The fabric is a beautiful pewter gray boucle with “Chanel” written all over the selvedge. I don’t really know what that means, except that perhaps the fabric was made for Chanel? I purchased the lining at this shop, as well. It’s a gray stripe silk – a beautiful piece that will look perfect with the boucle. I had to get silk thread in this exact, sort of odd gray color, silk buttonhole twist in the same color, 1/4″ cotton woven stay tape, gold chain, buttons, interfacing and trim. Most of that had to be ordered online, since there were no stores in my area that carried these items. For the trim, I took some of the fabric apart and made a braid. I made two other braids with some lighter and darker mohair, then I plaited the three braids together. If I use this braid, I will put a black petersham ribbon under it, since I can’t find a gray ribbon to match. The other option for the trim, and one I am favoring at the moment, is to fringe the boucle and use that as the trim. The fringe on the boucle is really pretty, as you can see in the picture, so that may be the one. Now I am ready to cut out the lining and interfacing. I am a very slow sewist as it is. This will take some time, and I intend to enjoy the process.